It’s all about ClearTrip.com, the best Online Travel Agent (OTA) in India. But, they’re much more than that. 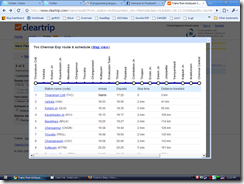 Coded by a bunch of great Indian developers, ClearTrip is a gem among the innumerable services on web and is an excellent example on How things are to be done and maintained. 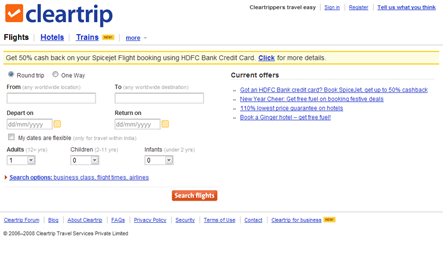 They started off offering Flight bookings, added Hotel reservations and a few weeks back, added Train Reservations too. The whole portal is a fine example of usability and efficiency, that leaves a scintillating memory in the minds of users, thereby making the important marketing principle work for them: “Get your product right into the customers’ mind”. The homepage contains just 8 images (including a logo, two meaningful “new” labels, two tiny calendar buttons and an arrow, a temporary announcement background, and A BUTTON). How brilliantly, they’ve stated “It’s not all about images!”. They’re an example for professionalism in usability. All the details that are required to plan a trip have been provided right at the front page. No “get-it-done-easy-with-our-wizard”s, no “Step X of Y”. Straight to the point. All this and a “Current Offers” section, and there is still a lot of free-space left on the page; lets you breathe smoothly. 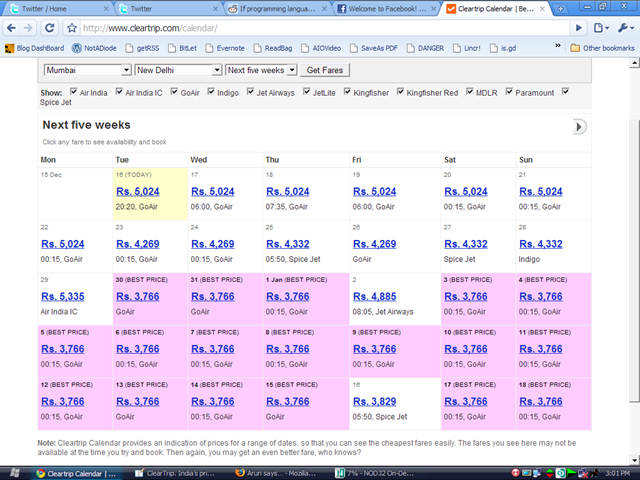 The best fares calendar is a seriously handy tool, not to mention the Air Fare graphs. Here again, usability thrives. What feels to me as the best is, the Train reservation system. It’s a power-packed bundle of handy and needed services and tools. The interface is similar to the flights section. 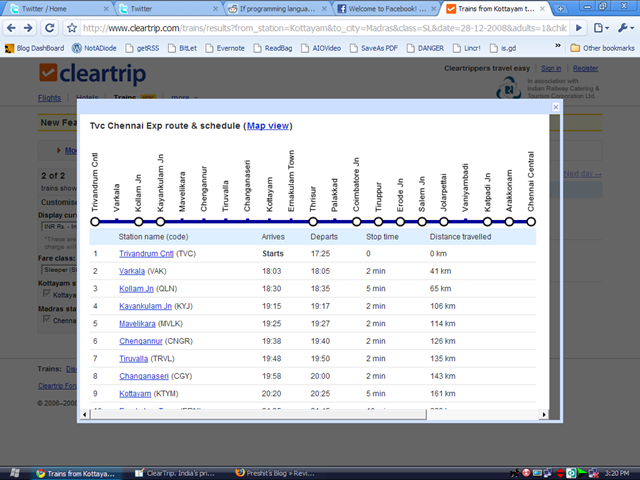 But, to understand the awesomeness of ClearTrip’s system, you need to have used Indian Railway’s official reservation system atleast once ! The most usable feature is the “Check availability”. It’s all coded inline, there by eliminating the need for multiple page loads. It appears right there on the same page. 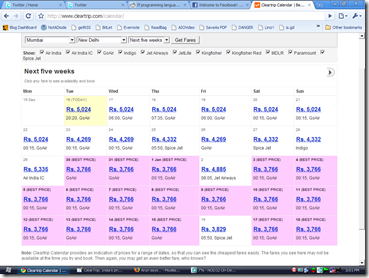 And you can even, view availability for next SIX days. The goodness doesn’t stop there. 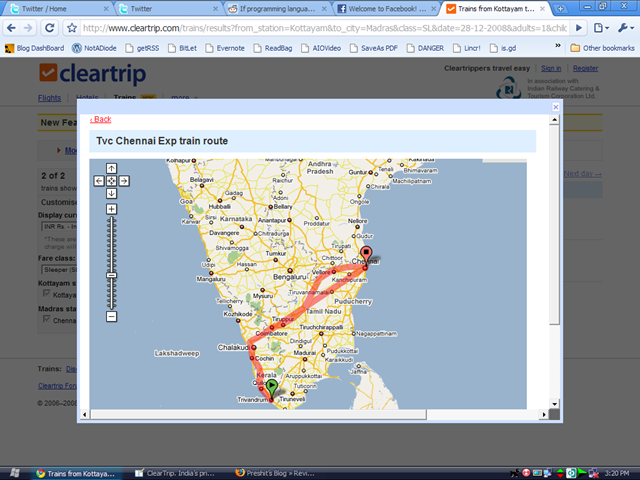 When you click on a train name, a box loads and shows you the schematic route diagram, and train-running details, where you have the option to view the route highlighted on Google Maps also. 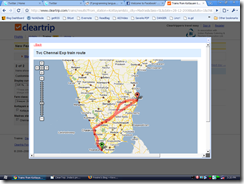 Know about your travel and route inside out with the informative graphics, maps and details. Thus we conclude the review of ClearTrip, the best online travel agent/service in India, which is a great example of a web app, that offers maximum usability at the same time, providing a rich and vivid experience. You know it’s a success, when these two (usability & design) coincide.